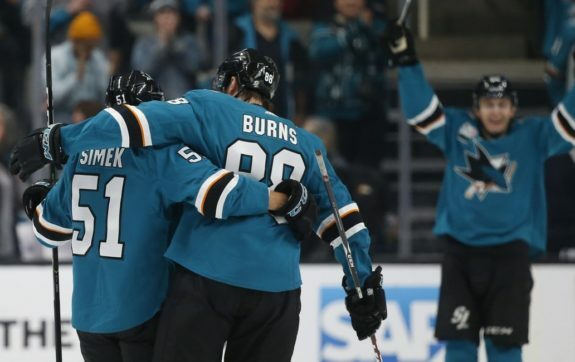 SAN JOSE, Calif. — Timo Meier scored twice, Joe Pavelski added his 20th goal of the season and the San Jose Sharks beat the New Jersey Devils 5-2 on Monday night for their fourth win in five games. Radim Simek scored his first NHL goal, Tomas Hertl added a late power-play score and Martin Jones stopped 22 shots for the Sharks, who have not lost in regulation at home since Nov. 15. Andy Greene and Drew Stafford each scored his first goal of the season for the Devils, who are a league-worst 3-11-2 on the road. Stafford gave New Jersey a 1-0 lead midway through the first period, but the Sharks responded with goals by Meier and Pavelski in a 2:12 span later in the period. Meier’s 15th goal came on a wrist shot over the right shoulder of Devils goalie Keith Kinkaid, and Pavelski gave the Sharks a 2-1 lead by pouncing on a rebound that Kinkaid failed to handle. Simek, playing in his fifth NHL game, made it 3-1 midway through the second period on a shot from just inside the blue line past a screened Kinkaid. Greene put a loose puck past Jones less than two minutes later to again pull the Devils within a goal. Meier’s second goal of the game, on another sailing wrist shot, came with five minutes left in the second period. Hertl’s goal with 5:37 left in the game was the Sharks’ first power-play score since Dec. 5. Notes: It was the 10th time that Pavelski has scored at least 20 goals in a season. . The Sharks didn’t get their first shot on goal until 10 1/2 minutes into the game, by which time the Devils already had seven shots. By the end of the first period, though, San Jose led 11-9 in shots. . The Sharks have a league-leading 41 goals in the first period this season. . The Devils won the only other game between the teams this season, defeating the Sharks 3-2 in New Jersey on Oct. 14. . Ottawa (3-9-1) is the only team in the league other than the Devils with just three road wins this season. . The Sharks, who entered the game third in the league in penalty killing, held the Devils scoreless on both of their power plays. Devils: Host Vegas on Friday. Sharks: Host Dallas on Thursday.